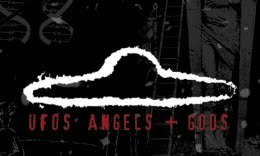 UFOs, Angels & Gods is a documentary connecting the dots on UFOs and the Angelic realm of Gods and their Flying Chariots as mentioned in the Bible and various other ancient texts which speak of Extraterrestrial Gods who seeded life here on Earth, coming back from time to time to help humanity evolve and gently steer us away from the path of self annihilation. There are parts in documentary where certain biblical text quoted is dualistic in nature creating the illusion of good and evil, which serves as a good opportunity to decide for ourselves if it resonates as the truth. Just like Buddha said, "Believe nothing, no matter where you read it or who has said it, not even if i have said it, unless it agrees with your own reason and your own common sense." Bible scholar, Barry Downing, firmly believes that biblical teachings were inspired by Extraterrestial beings who came to Earth in Flying Saucers. Downing was so convinced, he wrote a book about his theory called The Bible and The Flying Saucers (Lippincott, New York, 1968). In the book, Downing says the bible clearly points out how UFOs played a strong role in the evolution of the Hebrew-Christian faith. For example, Downing believes the Scriptures suggest that Jesus' resurrection occurred when he was beamed up from Earth by a flying saucer. Downing also believes that the bright cloud that led the people of Israel through the Red Sea, parting the waters and then engulfing the Egyptians, was a UFO. The Author says it was space beings who spoke to Moses from the middle of a glowing thicket, and later spoke to Elijah outside the cave, forcing the prophet to shield his eyes because of the brightness. A UFO took Jesus away at the Ascension, and hovered over Paul and his followers on the Damascus Road, Downing contends. 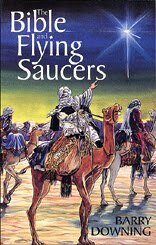 Further, the author claims the three wise men probably followed a UFO to Bethlehem, since stars do not move or abruptly stop in the manner the bible describes. All civilizations attribute their genesis to the Gods. All of the great religions speak of contact with beings who come from elsewhere. - Is there a connection between these accounts and the modern day UFO phenomenon? - Can accounts of flying beings from the Bible shed light on the identity of UFOs? - Are they mere observers or participants on the world stage? Does the modern day UFO phenomenon fall within the scope of biblical prophecy? All is One and there really is no other ... see beyond the illusions of separation propagated through mass fear psychosis ... by turning inward the truth is realized and once awake, the world becomes a harmonious dance of unity !